Rapid technological advancements in the smart devices have led to invention of modern tools and pioneering technologies like wearable devices. Wearables are modern devices that are not only used for the purpose of entertainment but are intended to bring high mobility, live access to data, and context-awareness into the lives of people in a hands-free manner. 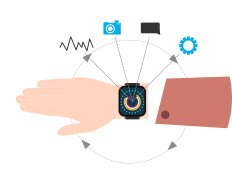 At BLE Mobile Apps our prime focus is to deliver custom wearable app development solutions to help you stay ahead of the game and gain competitive advantage. Also known as a Activity Trackers, it's a device for monitoring and tracking fitness-related metrics such as walking or running distance, calorie consumption, heart rate as well as quality of sleep. Know by various names such as E-textiles, smart garments or smart fabrics, these fabrics merge with electronic components and acts as sensors that stream real-time data to a smart phone. Popular fashion brands are launching smart clothes that monitors heart rate, breathing as well as stress levels. Wearable computing device worn on user's wrist that offers functionality and capabilities similar to those of a smartphone such as listening music, making calls, sending messages, and accessing various applications. Devices that deliver virtual information directly to your eyes. They provide enhanced user experience with features like recording & sharing videos, taking photographs, finding information among other things. Wearable jewelry includes a range of devices like earings, necklaces, bracelets & rings that alert users to important calls and texts when unable to access their phone. These sleek pieces of jewellery are deceptively smart and comes with the best of design and functionality. These are devices that are implanted under the skin through surgeries. Currently these are used in the form of Active Implantable Medical Devices (AIMD) such as pacemakers, defibrillators, nerve stimulators, etc. Being one of the early adopters of the wearable technology, we deliver innovative and user-experience focused solutions for wearable devices. In-house team of highly skilled and professional Wearable device app developers having in-depth knowledge of both iOS and Andr oid Wear development. Re-engineer your existing mobile applications and upgrade it to a wearable compatible app. Core focus on delivering quality product on time while following international coding guidelines & standards. Dedicated project manager and team for round the clock support and maintenance.